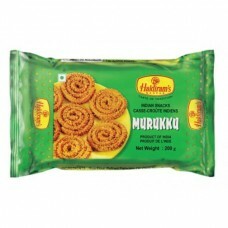 Haldiram Murukku is a very famous and traditional snack in Tamilnadu. It's very tasty and crispy and has many different flavors, like salty, sweet, sour, spicy, and very spicy. It made of ghee or oil which is always fresh and packed well. Murukku is mostly used during festivals, like Diwali, Pongal, Ugadi and so on.